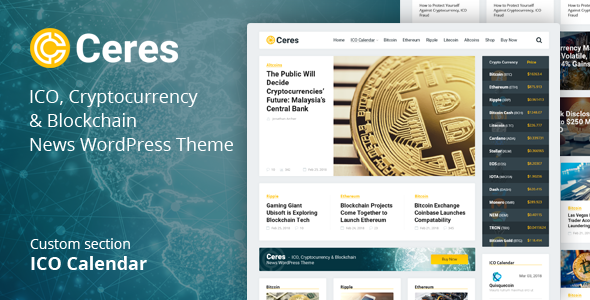 Ceres – Cryptocurrency & Blockchain News WordPress Theme. ICO Calendar. The Ceres theme is perfect for creating online media about the news of cryptocurrency and blockchain technology. Thanks to fully responsive design, your website will be perfectly look on all devices. 4 post templates, 6 custom widgets for the homepage and current cryptocurrency prices will make your online media unique. A modern clean design will attract the attention of readers and users. Section of ICO Calendar will collect in one place information about a technology startups. All demonstration images in the archive are not contained. Only for demonstration of the theme.